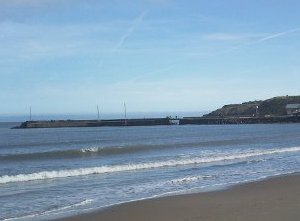 Ardamine Beach is a long sandy beach located in Courtown, County Wexford. At the curve in the beach, built up sand has created a shallow, stoneless sandbank where the waves break early before reaching the beach. Baginbun Beach is a secluded and sheltered beach located just outside Fethard in County Wexford. Ballinesker Beach is on the east coast of County Wexford, 5 miles north of Wexford Town. The Beach is a 3 mile section of a long stretch of sandy coastline extending from the Special Area of Conservation at the Raven Point to Ballyconniger Head, which is approximately 10 miles long. The Beach has an easterly aspect overlooking Wexford Bay and the Irish Sea and is bordered on the west by a line of sand dunes. The area is essentially rural with the nearest population centre in Wexford Town. Ballinesker Beach has been awarded the Blue Flag Beach 2015. Both Ballymoney North and South Beaches are extremely popular. From the southern beach there is a good size lane over the rocks connecting it to the northern beach. This beach has a lifeguard station and other amenities like toilets and a shop can be found at the southern beach. Cahore Beach is on the east coast of County Wexford, 35 kilometers north of Wexford Town. It is a 500m section of pebbled coastline. It has an easterly aspect overlooking the Irish Sea and is bordered on the west by car park and a line of sand dunes. The area is adjacent to the rural village of Cahore. This beach has been awarded the Green Coast Award for 2015.